Summer is about to end, and so is the the Pyramid of Light. The public art project built by South Lakes High School art students is slated to be dismantled on Friday. 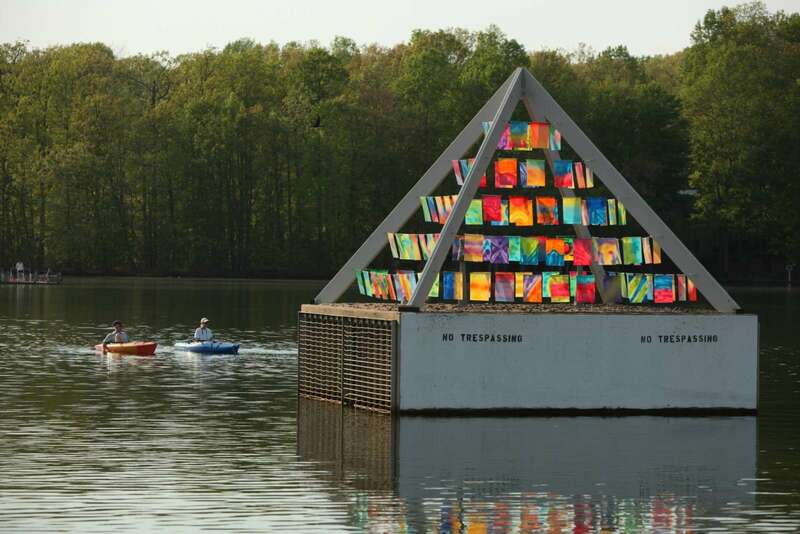 The project — a pyramid on the base of the concrete spilllway that features brightly painted plexiglass panels — was constructed on the Lake Thoreau spillway in early May. It was originally supposed to remain in place for half the summer. But the pyramid proved to be a crowd favorite, and the students got permission to leave it up through the end of August. They even returned to the site in July to repair the structure, which had seen many of its plexiglass panels blow away during storms. The repairs worked and the pyramid has been standing intact since. The student artists worked on the project for more than year, taking it from sketches to construction. The students had to go through the Reston Association’s Design Review Board process. 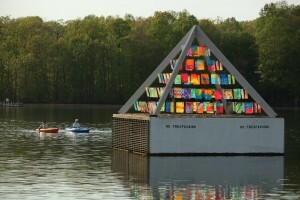 Turning the spillway into public art was the idea of James Pan, a Reston resident who suggested the concrete square that can be seen from South Lakes Drive would be a great space for art. He offered financial support if the students would work on a project, said Anne Delaney, executive director of Initiative for Public Art Reston, which sponsored the project. South Lakes High School art teacher Marco Rando, the advisor for the project, has said he would like to see more projects constructed on the spillway in the future.